Under a formal agreement with Defra – the GBGB published for the first time injury and ‘retirement’ data earlier in March this year and this was to be the focus of the meeting together with the industry’s Greyhound Commitment. The GBGB presented its 5 year plan to reduce euthanasia on economic grounds and uphold the Greyhound Commitment. They also announced the new apprenticeship scheme for kennel hands and confirmed that they would be conducting research on racing greyhounds in extreme temperatures but added that their funding had been cut by 20% due to high street bookmakers closing. Greyt Exploitations revealed how the GBGB had failed to comply with the formal agreement on a numbers of issues: failing to declare by what method greyhounds had left the industry and also failing to honour the agreement to gain UKAS accreditation for trainers’ kennels by December 2017. We also raised a number of other issues and evidenced how self-regulation has and never will work and ultimately called for dog racing to be outlawed. We also issued presentation packs to all attendees which included our hot-off- the- press report on Injuries in Racing Greyhounds – our new leaflets – a Tia Rescue leaflet highlighting their sponsor dogs who will receive life-time care and a copy of the GBGB’s retirement form. You can read our speech here together with our Power Point presentation. Next to speak was Professor Knight who evidenced why racing greyhounds on oval tracks will always result in a high risk of injury – explaining that the congestion at the first bend was responsible for 75% of fatalities and how the constant racing in an anti-clockwise direction forced the transfer of calcium to the inside limbs to compensate for the added stress and weakening others – thus increasing the chances of bone fractures. Clarissa Baldwin representing the Greyhound Forum covered the past failures of the GBGB to reform but acknowledged that it had tried and was now communicating more with the Greyhound Forum . She stated that the killing of greyhounds on economic grounds must be eradicated and that many trainers were reluctant to buy the new BSI standard for trainers’ kennels and chose to go without it. 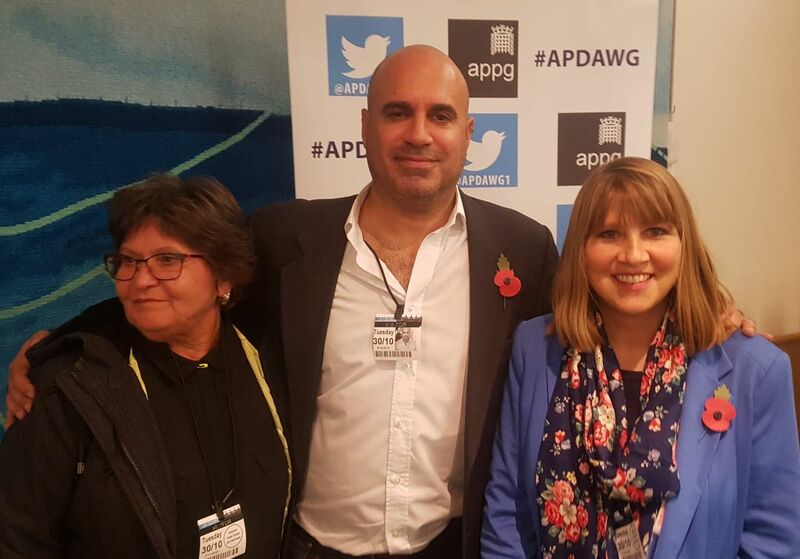 Nick Weston gave an excellent presentation on behalf of the League Against Cruel Sports and very rightly stated that if trainers couldn’t afford veterinary fees – then they clearly shouldn’t be racing greyhounds. Nick explained that as a carer of two ex- racing greyhounds – he was saddened that one of them couldn’t be let to run to their full capacity because of a damaged leg that was injured whilst racing. He also said that the industry had long enough to reform but consistently failed which was why the League had decided to call for a ban. Sadly Lisa Morris-Tomkins CEO Greyhound Trust had problems with transport and couldn’t attend. Thanks to APDAWG and Marc Abraham for hosting this excellent meeting and bringing such a diverse rage of opinions to the table. Thanks also go to Greyhound Compassion’s Lucinda Read for all her help in organising this event. Since this important meeting Forever Hounds Trust – a Greyhound Forum member – has published a statement calling for a phasing out of greyhound racing.